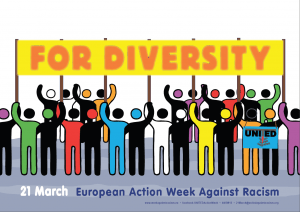 European Action Week Against Racism – join us! 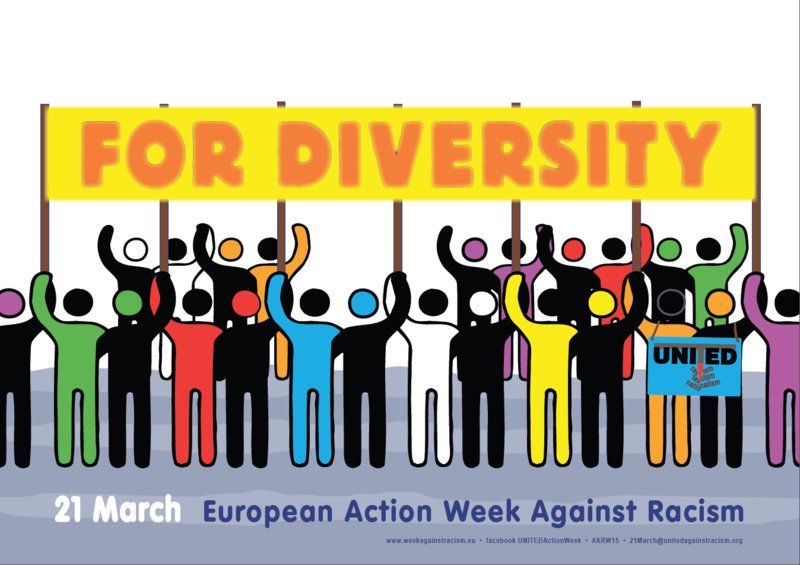 Every year from 14th-22nd March the European Action Week Against Racism takes place. This is organized by inter-governmental organization UNITED in cooperation with other inter-governmental organizations, community organizations, schools and local communities. 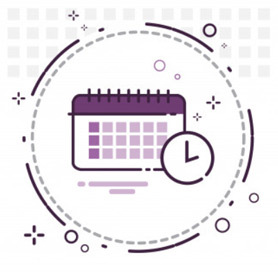 UNITED promotes many methods of participation in the European community and recommends those interested to find out more by visiting the website WeekAgainstRacism.eu. Here you will find details of previous campaigns, and you can get inspired and join the campaign. 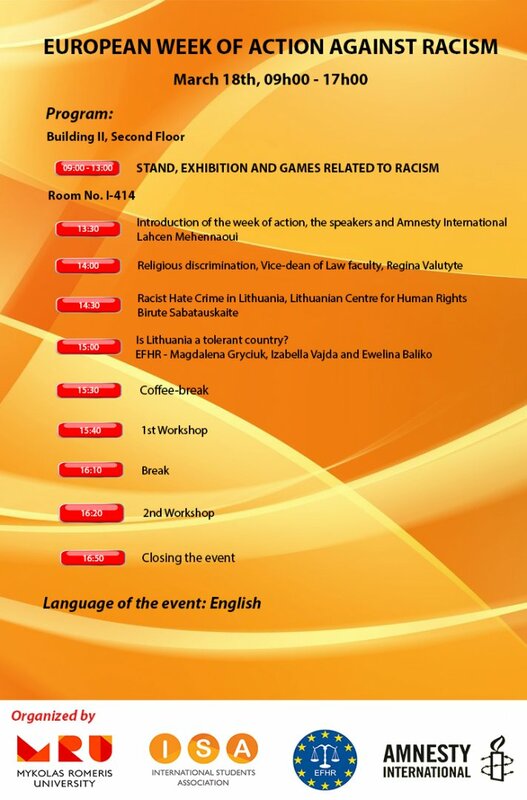 The main aim of the event is to fight against racism in the wider community and popularize the idea of diversity. UNITED is convinced that everyone can take part in the campaign because it does not require developed organizational skills, years of experience or a big budget. The only things you need to take part are a willingness to act and creativity. The European Foundation of Human Rights has actively supported the activities of UNITED for many years. This year EFHR, together with the International Student Association and Amnesty International (AI), invite everyone to a conference which is set to take place on 18th March at Mykolas Romeris University. Another event, also organized by EFHR, will take place on 20th March in Vincas Kudirka square. 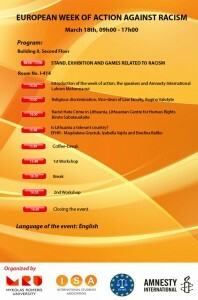 We have prepared a lot of interesting activities connected with encouraging diversity. Among other things, we will be inviting guests to a discussion about human rights in Lithuania. For younger participants we have prepared plays and quizzes which aim to help them understand the topic of human rights. Besides that, it will be possible to pose for photo in a special frame (i.e. with inscriptions like ‘I am tolerant’, ‘I look at a person, not at the skin colour’, ‘I do not judge by what I can see’). From these photos a collage will be made, and this will be available on the EFHR website. Everyone who is interested can take part in out action. You can read more about events that were organized by us in previous years here. UNITED for Intercultural Action is a European network against nationalism, racism, fascism and in support of migrants and refugees, in which over 560 organizations cooperate. The organizations have a common aim: fighting racism, which means not only criticizing policies related to race on the European and local level, but it also means counteracting racism and racial stereotypes in our own surroundings and in our own minds. More information is available here: www.unitedagainstracism.org.